Caesarean Scar Pregnancy: A Diagnostic and Therapeutic Dilemma - A Case Report. Introduction: With the increasing caesarean delivery rates, the risk of caesarean scar pregnancy is increasing. However, owing to its rarity, it poses as a diagnostic and therapeutic dilemma for the obstetrician. Case report: A 33 year old lady G3P1L1A1 at 8 weeks 3 days period of gestation was diagnosed as a case of viable caesarean scar pregnancy. She was treated with intracardiac potassium chloride, and intragestational sac and placental Methotrexate injection. She was followed up and at 12 weeks post treatment serum β HCG normalized and endometrial cavity was empty on transvaginal sonography. Conclusion: Diagnosis of caesarean scar pregnancy is difficult, but transvaginal sonography and colour flow Doppler may be helpful. Though the best and standard management is still unclear for this condition, the use of intracardiac KCl, and intra sac and placental Methotrexate can be considered in cases of viable caesarean scar pregnancy. Scar pregnancy, Caesarean scar pregnancy, Intracardiac KCl, Methotrexate. With the increasing caesarean delivery rates, apart from the risk of pathologically adherent placenta, the risk of another entity of implantation of gestational sac into the myometrium of hysterotomy scar, called as caesarean scar pregnancy is increasing. The reported incidence is 1/1800 to 1/2216 of all caesarean deliveries. The case reported here describes the use of intracardiac Potassium chloride, and intragestational sac and placental Methotrexate injection in a viable Caesarean scar pregnancy and its follow up. A 33 year old lady, G3P1L1A1 came to casualty at 8 weeks 3 days period of gestation with a transabdominal sonography reporting a suspected scar pregnancy. She had history of one episode of sudden onset dull aching pain in lower abdomen which subsided on its own. She had no other complaints. She had history of abortifacient intake 4 days before. Her obstetric history included a full term uneventful caesarean section 12 years back and a spontaneous abortion 3 years back at 1½ months amenorrhea not followed by evacuation. 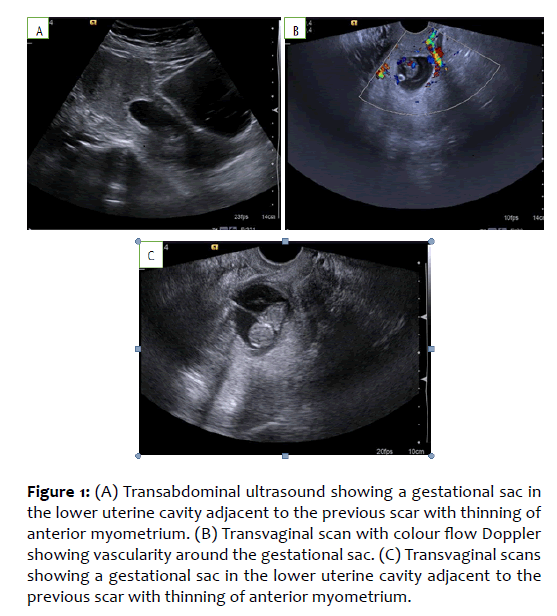 Figure 1: (A) Transabdominal ultrasound showing a gestational sac in the lower uterine cavity adjacent to the previous scar with thinning of anterior myometrium. (B) Transvaginal scan with colour flow Doppler showing vascularity around the gestational sac. (C) Transvaginal scans showing a gestational sac in the lower uterine cavity adjacent to the previous scar with thinning of anterior myometrium. 3) Increased vascularity in the adjoining myometrium. Initially, injection Methotrexate 50 mg intramuscularly was administered and TVS on the fourth day showed a gestational sac of 10 weeks with cardiac activity. After 3 days, TVS still showed a viable pregnancy. So under TVS guidance, 1.1 ml of 2 mmol/ml of potassium chloride was instilled into the fetal heart through a 20 gauge ovum aspiration needle. Injection Methotrexate 25 mg was instilled into the amniotic sac and placenta each. The fetus was observed for 5 minutes for confirming absence of cardiac activity. The patient was discharged on day 5th without complications and advised to follow up with weekly serum β HCG reports. One week after this procedure, serum β HCG dropped to 6691 mIU/ml and TVS showed residual products of conception in the previous sac site. Serum β HCG continued to show falling trend and normalized on day 84th (12 weeks) following treatment and TVS showed an empty endometrial cavity. Caesarean scar pregnancy, though rare, is a potentially life threatening condition. The exact cause of this entity has not been understood. However, many hypotheses have been proposed and one of them is that the conceptus enters into the myometrium through a microscopic tract between the prior caesarean scar and the endometrial canal. Early detection and treatment is necessary to avoid complications like uterine rupture, maternal mortality or adverse impacts on future fertility due to hysterectomy. Diagnosis is difficult but transvaginal sonography and colour flow Doppler using the following criteria may be helpful. • The presence of prominent or rich vascular pattern in the area of caesarean scar. Other diagnostic modalities are magnetic resonance imaging, hysteroscopy, laparoscopy or laparotomy. Hysterectomy may be required because of the risk of uterine rupture and uncontrolled bleeding. However, conservative treatments have been tried to preserve future fertility like local and systemic Methotrexate injection. In a case reported by Tulpin et al., local methotrexate injection was followed by uterine artery embolization to successfully treat a caesarean scar pregnancy. Lee et al. reported another case wherein they successfully treated a caesarean scar pregnancy at 9+3 weeks with bilateral uterine artery embolization followed by local injection of KCl and Methotrexate under sonographic guidance. In a retrospective case series by Timor–Tritsch et al., 19 patients with caesarean scar pregnancy were successfuly treated with combined intra muscular and intragestational methotrexate injection. In another case series by Pirjani et al., caesarean scar pregnancies were successfully treated with a combination of systemic methotrexate and local methotrexate or KCl. Though the best and standard management is still unclear for this condition, the use of intracardiac KCl, and intra sac and placental Methotrexate can be considered in cases of viable Caesarean scar pregnancy. Timor-Tritsch IE, Monteagudo A, Santos R, et al. The diagnosis, treatment, and follow up of cesarean scar pregnancy. Am J Obstet Gynecol. 2012;207:44.e1-13. Rotas MA, Haberman S, Levgur M. Cesarean scar ectopic pregnancies: etiology, diagnosis, and management. Obstet Gynecol. 2006;107:1373-81. Godin PA, Bassil S, Donnez J. An ectopic pregnancy developing in a previous caesarean section scar. Fertil Steril. 1997;67:398-400. Tulpin L, Morel O, Malartic C. Conservative management of cesarean scar ectopic pregnancy: a case report. Cases J. 2009;2:7794. Lee JE, Choe SA, Ku SY, et al. Successful conservative management of a viable cesarean scar pregnancy: a case report. Korean J Obstet Gynecol. 2012;55:274-7. Pirjani R, Bayani L, Shirazi M. Successful local and systemic medical treatment of cesarean scar pregnancy and a subsequent term pregnancy after treatment: a case series. Iran J Reprod Med. 2015;13:445-50. Journal of Basic and Clinical Reproductive Sciences is a peer-reviewed online journal with Semiannual print on demand compilation of issues published.